Milwaukee, Wisconsin:: Mark Klassen,, 2006.. Edition of 125. 5.25 x 5.5"; 24 pages. Saddle stitch binding. Drawings, printing, and binding by the artist. Signed and numbered by the artist. University of Wisconsin, library catalog: "Drawings of objects such as window blinds, door locks, electrical cabinets, etc. 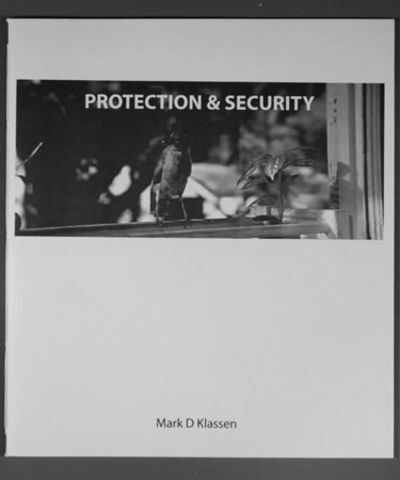 The artist investigates elements of protection and security in a post September 11 response. Drawing various gadgets and instruments that are supposed to make us feel safe." Influxstructure: A Topography of Ghosts. [San Antonio, Texas]:	: Coyote Bones Press,	, 2018. Los Angeles:	: Stephanie Gibbs,	, 2018.